I mentioned in a previous post I like to capture the audio for certain events, like training, when delivered by an industry expert. They’re always well practiced and concise communicators. They’re evangelism pitch worth studying. Selling ideas and influencing people is an important part of any design role. I’ve found it very useful to refer back to voice recordings I’ve made when I’m trying to find the best way to communicate a concept. It took me a few tries before hitting on the simplest, no effort, way to capture high quality audio in a typical training room environment so I thought it worth sharing here. My requirements were that, it be simple, low hassle, good quality and discreet. By discreet I don’t mean secret. It’s polite and desirable to get permission. What I mean by discreet, is not looking like an outside broadcast team. No mike stands, no mixing boxes and minimal cables. Logic would say this must work – surly? You can certainly make it work but, it’s not effortless. It’s not a primary use case right! The first problem is the microphone (the built in one). Its small, cheap, pointing the wrong way and if your typing while you’re listening the clicking will drive you mad later. Forget it. I tried several external microphones, the best of which came with a fairly high end Sony tape recorder. Things improved, but not acceptably. The recommended route at this point is an external sound interface and a decent quality microphone. A sound interface is a combined external sound card and microphone pre amplifier and plugs in via your USB port. I never got that far. I baulked at spending money on more hardware as I had other driver based issues. Admittedly I was using Vista on a Sony laptop at the time but the intermittent unreliability just defeated me. I’ve no idea why this would be so, just one minute it worked the next it didn’t. Since I tried all this, reasonably priced, good quality USB microphones have appeared. This may help since microphone quality is key. If you’re determined to use a laptop windows comes with its own sound recorder. Audacity however is the de-facto open source application and has far more functionality. The nail in the coffin for using your laptop comes with battery life. If you can guarantee you’ll be sat next to a power outlet fine. I couldn’t. To summarise; using your laptop is viable if you buy some hardware, don’t mind the cables, can guarantee power and are careful with your software settings. For my requirements there was just too much to go wrong. Now I come to write this I don’t know why I ever thought using a phone might work. For taking short dictations fine. For semi serious sound recording don’t waste your time. All the problems stated for laptops are more apparent to phones. The main points being the microphone just isn’t up to it and battery will be flat in no time. I did experiment with some downloaded Smartphone recording applications (I was using Windows Mobile) but they we’re all unreliable. Forget it. The remaining option is a stand-alone solid state recording device. No cable clutter, no device drivers and no software to learn. The marketplace starts with voice note taking recorders as used by doctors and architects then rises smoothly to top end, multi channel, solid state sound studios. 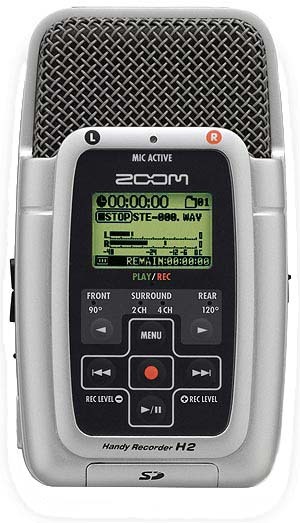 The transition from dictation machine to entry level sound recorder happens with two machines being repeatedly recommended. The Edirol R-09HR or the Zoom H2. I chose the Zoom as it was the cheaper. It has performed superbly. It came with a small table stand and an interview style handle, both of which screws into the base. Standing the unit on my desk it pick up everything, including questions from the delegates, very clearly. It is very easy to use and when plugged into a laptop via a USB cable appears as a storage device making downloads effortless. The display could be lager and proper buttons would be nice but those are minor points. The only slight issue I had was battery life. I managed about seven hours recording time on a set of batteries. Just make sure you’ve got some spares.